Wow, it is really Thanksgiving week! Where did the year go? If we have been following our dinner planning guides, we should already be thawing the turkey, making the pie crusts and freezing them and have all other components of the meal prepped and packaged. Ooooor, if you are like me, working full days all week long, you are praying there is a fresh turkey left in the grocery store on Tuesday and hoping your all-nighter on Wednesday pays off on Thursday. Then you can go into your well deserved tryptophan coma right after dinner. If this your situation, for whatever reason, do not fear. I am going to share my best secret for making my Thanksgiving memorable and stress free. The answer, one word…appetizers, like my Deviled Ham Cheese Ball. In my family, we have sort of a tradition with appetizers at the holidays. Everyone loves munching a little bit on fun appetizers while watching football or just relaxing before the big dinner. Plus, it gives me a little more wiggle room if the dinner does not look like it will be ready exactly as planned. I love to do appetizers that I can make ahead of time and are not too heavy. This Deviled Ham Cheese Ball is the perfect fit for that job. 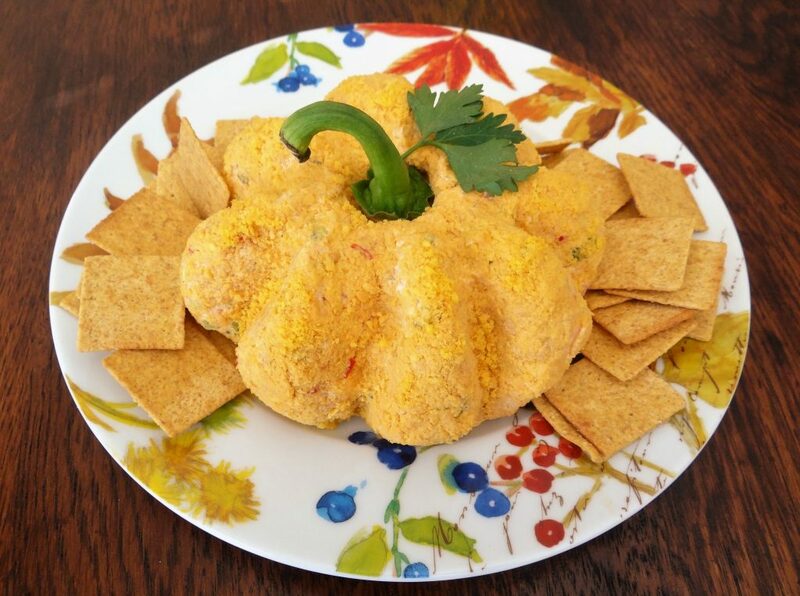 The best thing about this appetizer is that it doubles as a fall decoration. That is, until it is gobbled up. My Deviled Ham Cheese Ball is also a super simple recipe. Most of the ingredients you probably have on hand. The recipe starts with cream cheese as the base. Then you just toss together diced ham, shredded cheese, veggies and some spices. What could be easier? And you can just slice a chunk of your dinner ham off before you cook it, to use for the recipe. No one will even notice! 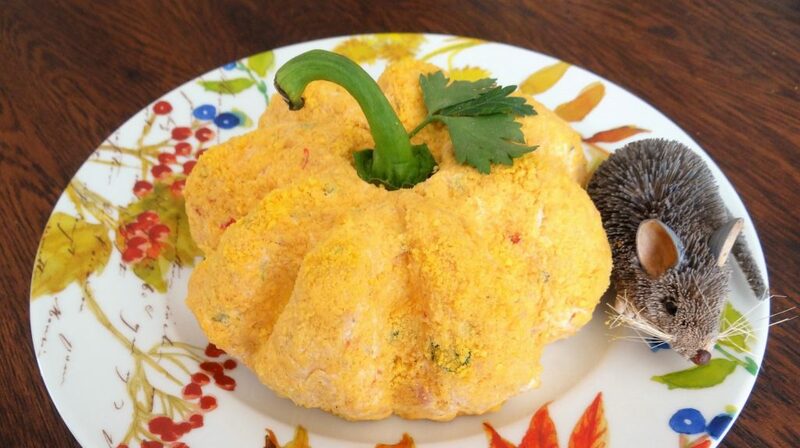 My favorite part of the Deviled Ham Cheese Ball is shaping it into its pumpkin shape and adding on the extra decorations and props to make it a special holiday appetizer. Plus, it will be one of those times that it is OK for you to “play with your food”. Pair this recipe with other light recipes like my Antipasto Platter to complete your appetizer table. Now relax, enjoy cooking with your family and friends and making more Thanksgiving memories! Soften cream cheese by letting it sit out at room temperature for 1 hour. Process crackers in a food processor or place in a tightly sealed ziploc bag and crush using a spoon or rolling pin. Set aside. Place cream cheese in a bowl. Add remaining ingredients, except for crackers. Mix thoroughly, shape into a ball. Wrap in plastic wrap and chill for at least one hour or up to 2 days. 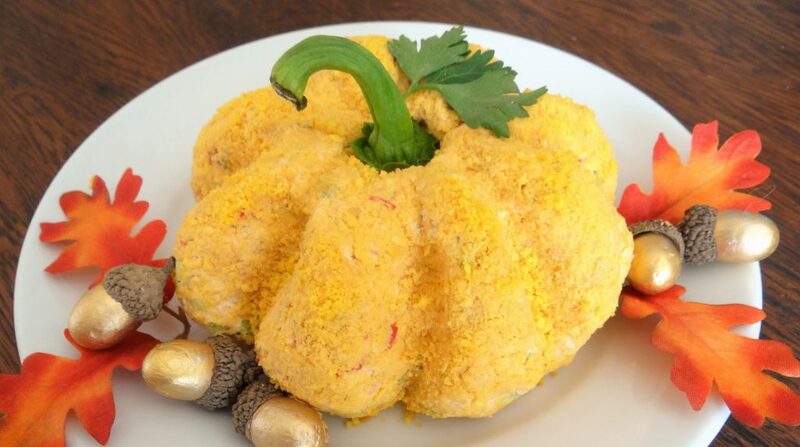 Roll cheese ball in crushed cheese crackers. Form the ball into a pumpkin shape by pressing down the top and making a small indentation. Next, make grooves around the ball using the back of your hand, a pastry scraper or spatula. Fill in any bare spots with additional crackers. Decorate with parsley, red pepper stem and other fall decorations. Serve with vegetables and crackers.